The last one of these in particular I think was particularly important: people who just wanted to get data they could use felt they were being sold semantic web tech that they didn’t need, and that was getting in the way of more straightforward ways of accessing the data they needed. However, nowadays I think there is a compelling reason to have a good command of SPARQL, and that is: the Wikidata project. Wikidata is an amazing project, with an ambitious goal on the scale of OpenStreetMap or Wikipedia: to provide a structured database of the world’s knowledge maintained by volunteers (and, like Wikipedia, anyone can edit that data). One of the motivations for the Wikidata project is that lots of data that you see on Wikipedia pages, particularly in the infoboxes, is just stored as text, not structured data. This creates the strange situation where data like the population of a city might be different on the German and French Wikipedia and each language community maintains that independently – a massive duplication of effort. Some of these infoboxes are now being migrated to be generated from Wikidata, which is a huge win, particularly for the smaller Wikipedia communities (e.g. Welsh Wikipedia has a much smaller community than Spanish Wikipedia so benefits a lot from being able to concentrate on things other than redundantly updating data). However, because of its potential as a repository for structured data about anything notable, the project has become much more than just a way of providing data for Wikipedia info boxes, or sitelinks – data in Wikidata doesn’t necessarily appear in Wikipedia at all. A project that I’m involved in at work, for example, is writing tools to help to get data about all the world’s politicians into Wikidata. This effort grew out of the EveryPolitician project to ensure its long term sustainability. Why might Wikidata change your perception of SPARQL? The standard way to run queries against Wikidata nowadays is to write SPARQL queries using the Wikidata Query Service. The Wikidata Query Service seems to work very reliably. We’ve been using it heavily at work, and I’ve been happy enough with its reliability to launch a service based on making live queries against it. Data quality varies a lot between different subjects in Wikidata (e.g. data about genes is very high quality, about politicians less so – so far!) but it’s getting better all the time, and you can always help to immediately fix errors or gaps in the data when you find them, unlike with other many other data projects. For lots of things you might want to do, though, the data is already good enough. Lots of open data that governments, for example, release has a naturally tabular structure, so the question “why should I learn SPARQL just to get a CSV file?” is completely valid, but Wikidata’s data model is (like the real world) very far from being naturally tabular – it’s a highly interconnected graph, supporting multiple claims about particular facts, with references, qualifiers and so on. If you all you want is a CSV file, you (or someone else) can write some SPARQL that you can use in a URL that returns a CSV file, but you wouldn’t want to try to cope with all of Wikidata as a CSV file – or even all the information about a particular person that way. You can find some fun examples of the kinds of things you can query with SPARQL in Wikidata at the WikidataFacts Twitter account, e.g. When was the first UK parliament when there there were more women MPs than MPs called “John”? Which musical instruments are most depicted in works of art? What’s the family tree of the Weasleys in Harry Potter? There are some nice ways of visualizing results built into the Wikidata Query Service, like timelines, graphs, images, maps, etc. As an example of something I made that uses Wikidata (as a fun holiday project) here’s a site that can suggest a random episode of your favourite TV programme to watch (there are links at the bottom of the page to see the queries used in generating each page) and suggests ways of improving the data. Finally, here’s a silly query I just wrote – I knew that Catmando was unusual in being a cat that was a leader of a political party, but wondered if there are other animals that have an occupation of “politician”. It turns out that there are! (click the “play” icon to run the query and see the results). There’s an excellent tutorial on using SPARQL to extract data from Wikidata. I’d definitely recommend starting there, rather than more generic SPARQL tutorials, those others will tell you lots of things you don’t need to know for Wikidata, and miss out lots of useful practical tips. Also, the examples are all ones you can try or play with directly from the tutorial. It’s a long tutorial, but you’ll get a lot of out of it even if you don’t got through the whole thing. The original idea of this post was to pass on some tips that helped me to write SPARQL better (which I mostly got from Tony Bowden and Lucas Werkmeister) – though it turns out that lots of these are in the tutorial I linked to above in some form or other! Nonetheless, I figure it might be useful to someone to reiterate or expand on some of these here. Some are quite basic, while others will probably only make sense after you’ve been writing SPARQL for a bit longer. If you don’t know which property or item you want, you can follow “wdt:” or “wd:” with some plain English, and hit “ctrl-space” to autocomplete it. If you mouse-over a property or item, the tooltip will give you a human readable description of it. Of course, writing queries in the Wikidata Query Service form also means you can try them out just with a button press (or control-enter :)). (which asks for any item that is an ‘instance of’ (P31) the item ‘television series’ (Q5398426)) wouldn’t return The Simpsons, since that’s an instance of ‘animated series’ (Q581714) instead. … it will include The Simpsons. That new version of the query essentially asks for any item that is an instance of ‘television series’ or anything that is a ‘subclass of’ ‘television series’ if you keep following that ‘subclass of’ relationship up the hierarchy. … which will consider an ‘instance of’ relationship even if there are multiple ‘instance of’s and another one has the ‘preferred’ rank. I’ve written more about the ‘p:’ and ‘ps:’ predicates below. This should be much easier to understand in your output. The default languages of “[AUTO_LANGUAGE],en” won’t be what you want in every situation. For example, in queries for politicians from Argentina, it made more sense for us to use “es,en”, which is saying to use the Spanish label if present, or otherwise an English one. You should be aware that Wikidata has more flexible ways of representing names of people than the labels attached to the person’s item. In your WHERE clauses, if you’re making lots of constraints with the same subject, you can avoid repeating it by using a semi-colon (;). There’s a nice example of this in the tutorial. With helpful indentation, this can make your queries shorter and easier to read. As you can see, there are two “educated at” statements for Douglas Adams, and the only information that a wdt:P69 pattern extracts are the items representing the institution itself. As you can see in that diagram, there’s lots more information associated with those statements, like references and qualifiers which you can’t get at just with a wdt: prefix. A further limitation is that if there are multiple statements, the wdt: predicates only extract the most “truthy” statements – so if one of them is given preferred rank, that’s the only one that’ll match. Then you can use other predicate types like pq:, ps:, pr: and prov:wasDerivedFrom to access details within those boxes. You can read in more detail about those predicates in this page I wrote (that I made these diagrams are for). Because lots of data in Wikidata is currently incomplete, you’ll often want to use OPTIONAL clauses in your WHERE query in situations where there’s extra information that might be helpful, but you don’t want its absence to prevent items from being returned. Note also that you can nest OPTIONAL clauses, if you have OPTIONAL data that might depend on other OPTIONAL data. Whether there’s a ‘series’ statement relating the episode to its season at all. If there is such a ‘series’ statement, whether there’s a ‘series ordinal’ qualifier on it. This post was originally intended for the mySociety blog, but because of its length and technical content people suggested to me it might be more suitable for my own blog. This about the development of the YourNextRepresentative project (GitHub link), and in particular why and how we migrated its storage system from using the PopIt web service to instead use PostgreSQL via django-popolo. Hopefully this might be of interest to those who have been following the development of YourNextRepresentative (previously YourNextMP). For the 2015 General Election in the UK, we developed a new codebase to crowd-source the candidates who were standing in every constituency; this site was YourNextMP. (Edmund von der Burg kindly let us use the yournextmp.com domain name, which he’d used for his site with the same intent for the 2010 election.) We were developing this software to help out Democracy Club, who ran the site and built up the community of enthusiastic contributors that made YourNextMP so successful. At the time, we saw this crowd-sourcing challenge as a natural fit for another technology we had been developing called PopIt, which was a data store and HTTP-based API for information about people and the organizations they hold positions in. PopIt used the Popolo data model, which is a very carefully thought-out specification for storing open government data. The Popolo standard helps you avoid common mistakes in modelling data about people and organisations, and PopIt provided interfaces for helping people to create structured data that conformed to that data model, and also made it easily available. A user experience specific to the task of crowd-sourcing election candidate data, rather than the very generic and unconstrained editing interface of PopIt’s web-based UI. Versioning of information about people, including being able to revert to earlier versions. Lookup of candidates by postcode. Summary statistics of progress and completion of the crowdsourcing effort. Logging of actions taken by users, so recent changes could be tracked and checked. CSV export of the data as well as the JSON based API. Later on in development we also added more advanced features such as a photo moderation queue. To help support all of this, the YourNextMP front-end used a traditional RDBMS (in our case usually PostgreSQL), but effectively PopIt was the primary data store, which had all the information about people and the posts they were standing for. Internationalizing all text in the codebase, so that it could be localized into other languages. We worked on this with the target of supporting a similar candidate crowd-sourcing effort for the general election in Argentina in 2015, which was being run by Congreso Interactivo, Open Knowledge Argentina and the Fundación Legislativo. This new version of the code was deployed as part of their Yo Quiero Saber site. Since the name “YourNextMP” implies that the project is specific to electoral systems with Members of Parliament, we also changed the name to YourNextRepresentative. This name change wasn’t just about international re-use of the code – it’s going to be supporting the 2016 elections in the UK as well, where the candidates won’t be aspiring to be MPs, but rather MSPs, MLAs, AMs, mayors, PCCs and local councillors. The lack of foreign keys constraints between objects in PopIt, and across the interface between data in PostgreSQL and PopIt meant that we were continually having to deal with data integrity problems. PopIt was based on MongoDB, and while it used JSON schemas to constrain the data that could be stored in the Popolo defined fields, all other data you added was unconstrained. We spent a lot of time of time writing scripts that just fixed data in PopIt that had been accidentally introduced or broken. Developers who wanted to work on the codebase would have to set up a PopIt locally or use our hosted version; this unusual step made it much more awkward for other people to set up a development system compared to any conventional django-based site. PopIt’s API had a confusing split between data that was available from its collection-based endpoints and the search endpoints; the latter meant using Elasticsearch’s delightfully named “Simple Query String Query” which was powerful but difficult for people to use. It was possible (and common) to POST data to PopIt that it could store in MongoDB but couldn’t stored in Elasticsearch, but no error would be returned. This long-standing bug meant that the results you got from the collections API (MongoDB-backed) and search API (Elasticsearch-backed) were confusingly inconsistent. The latency of requests to the API under high load meant we had to have a lot of caching. (We discovered this on the first leaders’ debate, which was a good indication of how much traffic we’d have to cope with.) Getting the cache invalidation correct was tricky, in accordance with the usual aphorism. As developers we wanted to be able to use a traditional RDBMS again (through the Django ORM) while still getting the benefits of the carefully thought-out Popolo data model. And, happily, there was a project that would help use to do exactly that – the django-popolo package developed by openpolis. django-popolo provides Django models which correspond to the Popolo Person, Organisation, Membership, Post and Area classes (and their associated models like names and contact details). Using the standard Django integer primary key id field rather than a character-based id field seems to be closer to Django’s “golden path”. The one or many elections that each Post is associated with. The particular election that a Membership representing a candidacy is associated with. The set of parties that people might stand for in a particular Post. (e.g. there’s a different set of available parties in Great Britain and Northern Ireland). The ‘versions’ attribute of a Person, which records all the previous versions of that person’s data. (We considered switching to a versioning system that’s integrated with Django’s ORM, like one of these, but instead we decided to just make the smallest incremental step as part of this migration, which meant keeping the versions array and the same JSON serialization that was used previously, and save switching the versioning system for the future. To support proportional representation systems where candidates are elected from a party list, each Membership representing a candidacy needs a “party_list_position” attribute to indicate that candidate’s position on the party list. Perhaps the most natural way of adding this data would be through multi-table inheritance; indeed, that is how SayIt uses django-popolo. However, we were wary of this approach because of the warnings in Two Scoops of Django and elsewhere that using multi-table inheritance can land you with difficult performance problems because queries on the parent model will use OUTER JOINs whether you need them or not. We decided instead to follow the Two Scoops of Django suggestion and make the one-to-one relationship between parent and child table explicit by creating new models called PersonExtra, PostExtra, etc. with a `base` attribute which is a OneToOneField to Person, Post, etc., respectively. This means that the code that uses these models is slightly less clear than it would be otherwise (since sometimes you use person, sometimes person.extra) but we do have control over when joins between these tables are done by the ORM. Once the Extra models were created, we wrote the main data migration. The idea of this was that if your installation of YourNextRepresentative was configured as one of the known existing installations at the time (i.e. the ELECTION_APP setting specified the St Paul, Burkina Faso, Argentina or the UK site) this data migration would download a JSON export of the data from the corresponding PopIt instance and load it into the django-popolo models and the *Extra models that extend them. As the basis for this migration, we contributed a PopIt importer class and management command upstream to django-popolo. This should make it easier for any project that used to use PopIt to migrate to django-popolo, if it makes sense for them to do so. Then the data migration in YourNextRepresentative subclassed the django-popolo PopItImporter class, extending it to also handle the extra-Popolo data we needed to import. Another issue that came up in working on this data migration is that we needed to preserve any identifiers that were used in URLs on the site previously so that after upgrading each site every bookmarked or search-engine-indexed URL would still show the same content. In the case of the Person model, this was easy because it used an integer ID previously. Parties and posts, however, used strings as their IDs. We migrated these IDs to fields called ‘slug’ (perhaps a slightly misleading name) on the OrganisationExtra and PostExtra models. This turns out to be quite a slow migration to run – as well as importing the core data, it also downloads every image of people and parties, which is pretty slow even on a fast connection. We did think about whether we could avoid doing this update of the code essentially in one go – it felt rather like a “stop-the-world refactoring”; was there an incremental approach that would have worked better? Maybe so, but we didn’t come up with one that might reasonably have saved time. If the old code that interacted with the PopIt API had been better encapsulated, perhaps it would have made sense to use proxy models which in the migration period updated both PopIt’s API and the database, but this seemed like it would be at least as much work, and it was lucky that we did have a period of time we could set aside for this work during which the sites weren’t being actively updated. We introduced Election and AreaType models (previously the elections that a site supported and the types of geographical boundary they were associated with were defined in a dictionary in the per-country settings). We introduced a PartySet model – this is to support the very common requirement that different sets of parties can field candidates in different areas of the country. These all had the effect of simplifying the setup of a new site – more of the initial setup can now be done in the Django admin interface, rather than needing to be done by someone who’s happy to edit source code. One of the nice aspects of using PopIt as the data store for the site was that it supplied a RESTful API for the core data of the site, so we previously hadn’t had to put much thought into the API other than adding some basic documentation of what was there already. However, after the migration away from PopIt we still wanted to provide some HTTP-based API for users of the site. We chose to use Django REST framework to provide this; it seems to be the most widely recommended tool at the moment for providing a RESTful API for a Django site (and lots of people and talks at djangocon EU in Cardiff had independently recommended it too). Their recommendations certainly weren’t misplaced – it was remarkably quick to add the basic read-only API to YourNextRepresentative. We’re missing the more sophisticated search API and various other features that the old PopIt API provided, but there’s already enough information available via the API to completely mirror an existing site, and Django REST framework provides a nice framework for extending the API in response to developers’ needs. Working on the codebase has become a vastly more pleasant experience; I find I’m looking forward to it working on it much more than I ever did previously. We’ve already seen signs that other developers appreciate that it’s much more easy to set up than previously. The UK instance of YourNextRepresentative (at edit.yournextmp.com) has been using the new codebase for some time now, and that will be relaunched shortly to collect data on the 2016 elections in the UK. If you’re interested in starting up an candidate crowd-sourcing site using YourNextRepresentative, please get in touch with our international team or email ynr@mysociety.org for any other issues. On one of the projects I’ve been working on at mySociety had a large number of open issues, most of which hadn’t been looked at for some time, and didn’t have estimates of difficulty. To address this we tried a variation of an exercise that’s suggested in “The Scrum Field Guide” in the chapter called “Prioritizing and Estimating Large Backlogs”, which involves printing out all the stories in the product backlog onto index cards and arranging them on a wall roughly in order of difficulty from left to right. (A second stage is to let the product owner adjust the height of each story on the wall to reflect its priority.) It seemed as if this might be a helpful way of estimating our large number of open issues, even though they’re not written as users stories. As it turned out, this session was pretty successful – as well as the value of generating lots of difficulty estimates, it was a good way of getting a picture of the history of the project, and starting lots of discussions of issues that only one member of the team knew about. On Ubuntu or Debian, it’s really simple to create an encrypted partition on a newly-purchased USB mass storage device. In my case, I had bought a 1TB hard drive which had very mixed reviews, some people saying their drives had failed very early. I wanted to be able to return the drive under warranty if it broke without worrying about personal data. …. where /dev/partitiondevice is the device for the drive partition you want to overwrite. Obviously, this will destroy everything that was previously on that partition. I like to use a proper filesystem for USB mass storage devices, but if you leave out the -t ext4 then the default is to use VFAT. Update: It is now possible to buy an official subscription to The Guardian and The Observer. 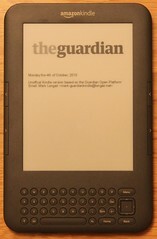 The rest of this post is now largely of historical interest if you just want The Guardian on your Kindle, but I’ve left the rest of the content unchanged for people who are interested in how I generated my unofficial version. If you just want a copy of today’s copy of The Guardian or The Observer for you Kindle, you can download one from this automatically generated page. This post describes the script that generates that generates the file and the motivation for it. Since moving to Switzerland, I’ve found that I really miss being able to get The Guardian in the morning on my way into work. Unfortunately, reading the website on a phone (or any other device) is no substitute if you’re relying on data over the mobile phone networks – one really wants all the articles cached for fast navigation through the paper. 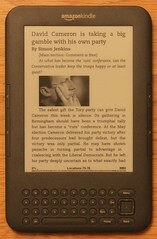 The solution for this should be my shiny new Kindle, but sadly subscriptions to The Guardian aren’t available in the Kindle store. (There are many other papers available.) 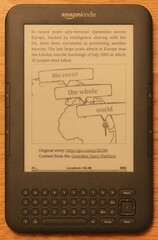 Fortunately, The Guardian has an excellent API for accessing its content, and the lovely interface produced by Phil Gyford for reading the paper in a cleaner interface suggested that I could similarly generate a bare bones version of the paper for my Kindle. I believe that this is permitted under the terms and conditions of the Guardian Open Platform, since I’m (a) including the advertisement linked to from each article, (b) linking back to the original article and (c) acknowledging that the data is supplied by that service. If I’ve misunderstood, and in fact this is not allowed, please let me know. 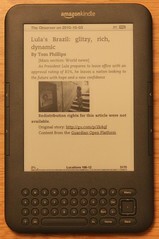 You can bookmark that page in your Kindle’s web browser. 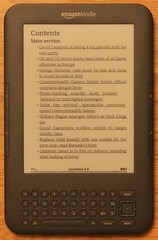 Then, whenever you select the bookmark and then “Reload”, then it’ll be refreshed with a link to that day’s generated edition of the newspaper for your Kindle, which you can download straight from that page. … or leave a comment below. The script for generating this version of The Guardian is available at github. Hosting large amounts of data on a generic shell account is typically quite expensive. Flickr‘s “pro” account subscription is a very good deal in comparison: as long as each photo is beneath 20 megabytes in size, you can upload as many as you like for $24.95 a year. The community aspect of sites like Flickr is very encouraging – it’s lovely to have random people say nice things about your photographs, and occasionally have people use them in articles, etc. You can simply check which photos have already been uploaded. You can find URLs for all the different image sizes, etc. based on the content of the file. LyX is a lovely bit of software for preparing beautiful documents – you get the high quality output of LaTeX and the advantages of logical document description in a usable interface and without having to remember TeX syntax. There are a few aspects of using LyX that puzzled me while writing a certain large document, however – many of these are dealt with in the LyX FAQ, but I thought it would be worth collecting those that were most useful to me here. convert "$1" png24:"$t" && mv "$t" "$1"
Obviously you need imagemagick installed for the “convert” command. This scales the table such that the width of the table fits the page width. … or you may find the caption too close to the graphics. As explained in the second question in this mini-FAQ on generating PDFs from LyX you should use the outline font version of Computer Modern instead of the bitmapped versions. For me, this boiled down to going to Document -> Settings -> Fonts and setting the Roman font option to “AE (Almost European)”. You might notice that adding footnotes in table cells doesn’t work. One answer to this is manually add them in ERT with \footnotemark and \footnotetext, possibly adjusting the counter as described in that FAQ entry.